A glossy red surface and glittery green details lends a lifelike quality to the decorative apple design. Deceptively innocent in its appearance, the iconic Poisoned Apple also serves as a lesson that you can overcome obstacles if you stay true to yourself and your friends.This item is a single charm only. Bracelets sold seperately. Styling images may show this charm on a bracelet as styling inspiration. Disney Snow White's Apple Charm is rated 4.9 out of 5 by 27. Rated 5 out of 5 by DisneyLove from Favorite Charm I bought this while in Disney World and it is by far my favorite charm I have ever purchased! I love the pop of red, and the enamel is done beautifully. It does turn around when put on an empty bracelet but on a full bracelet it stays right in place:) Beautifully done! Rated 5 out of 5 by Bound4Bangkok from Beautiful! I'm a teacher and dithered between the pavé apple and the Snow White Apple, but I loved the poison story behind the Disney one and I'm glad I did. Perfect! Rated 5 out of 5 by Karetz from Adorable Apple!! I bought this for my daughter in law who is working on her masters program of becoming a teacher, perfect gift! Rated 5 out of 5 by I love Pandora 1966 from I purchased this last night. 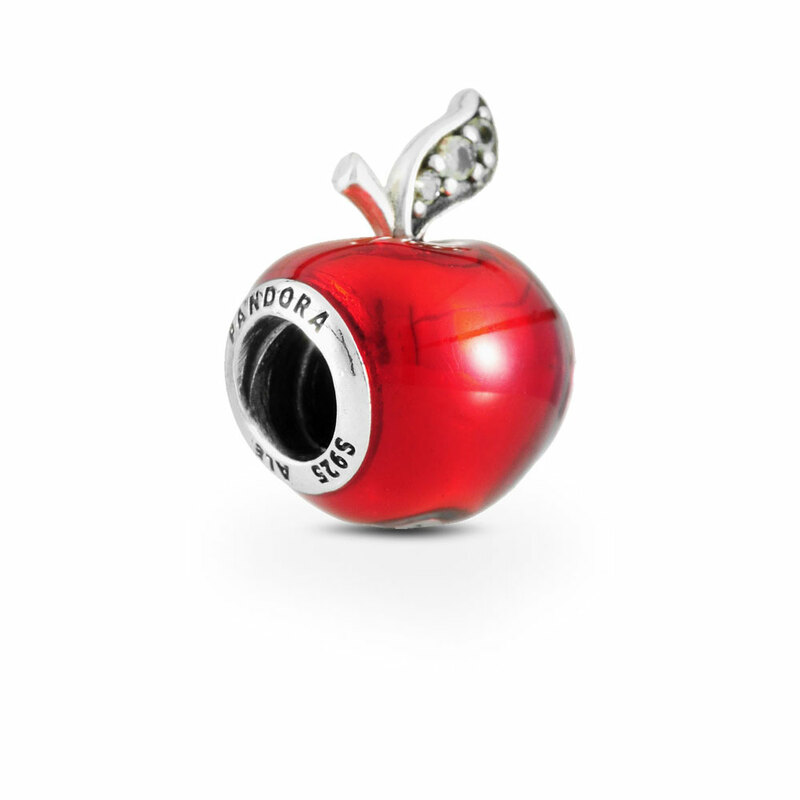 As a teacher, I wanted something similar to an apple to start off my first charm bracelet. Unfortunately, they were out of stock of the cheaper teacher charms. Remembered noticing the Snow White Apple charm in their booklet. Was pleasantly surprised to find out that this was in stock at the store where I purchased it. It is such a lovely shade of red. Thrilled to pieces with my very first charm and charm bracelet. Cannot wait to add more charms. Rated 5 out of 5 by DisneyKim from Enchanting! I got this Snow White Apple charm last year for my birthday; it's as beautiful to me now as ever. So glossy and vibrant in color, it really adds a magical quality to my Disney bracelet. Anyone who buys this charm will not be disappointed - it's beautiful! Rated 5 out of 5 by Bronwyn from Great I bought this to go on my Disney charm bracelet, beautiful, love the color and detail!